Southeast entrance to Rockland harbor. Located at the end of Sherman's Lane, off North Shore Drive (the road to Owl's Head) on the south side of Rockland. Site and tower closed (private residence). One of the newest lighthouses added to the Maine Coast Guard list and the only lighthouse in New England that has been privately built. Lighthouse enthusiast Bruce Woolet, with the help of the Maine Lighthouse Museum (formally the Shore Village Museum) in Rockland for accuracy, built Rockland Harbor Southwest in 1985. In 1987, Woolet obtained the license to have the lighthouse become an official Coast Guard lighthouse. The Coast Guard accepted the lighthouse as a privately maintained aid to navigation. It was sold in 1998 to the new owner, John Gazzola, who continued to renovate the building. You can find this lighthouse on the way to Owl's Head Light, which is also off Route 73. Be wary it is a private residence, and is not open to the public. Enjoy picnicking at Owls Head Light State Park, and walk along some of the trails along the cliffs and shoreline, and you can walk up to Owl’s Head Light as well. The lighthouse is situated atop spectacular cliffs with wonderful views of Rockland Harbor and the coastline and is easily accessed by a stairway. 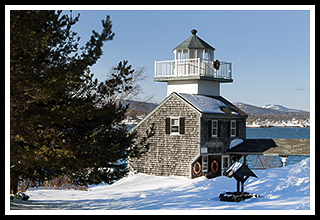 Take time to visit the Maine Lighthouse Museum in Rockland, one of the most famous lighthouse museums in the world. Take the Maine State Ferry out of Rockland Harbor to explore the surrounding islands at Vinalhaven. It can by viewed across a small cove, or, if you're discreet, from this person's driveway. To view the lighthouse across the small cove, take Route 1 into Rockland, then take a right onto Route 73 (you can also head out to see Owl's Head Light along this route). When you see Everett Avenue on your left follow down to the shoreline to view the lighthouse. To view the lighthouse from the residence, follow along Route 73 until you see a sign for a dirt fire road labeled FR C230. If you've gone past "Admiral's Attic, you've gone too far. Follow along that road to the end, and then bear right at the sign describing the lighthouse.